It's almost Halloween (or should we say Howloween! Woofs!) 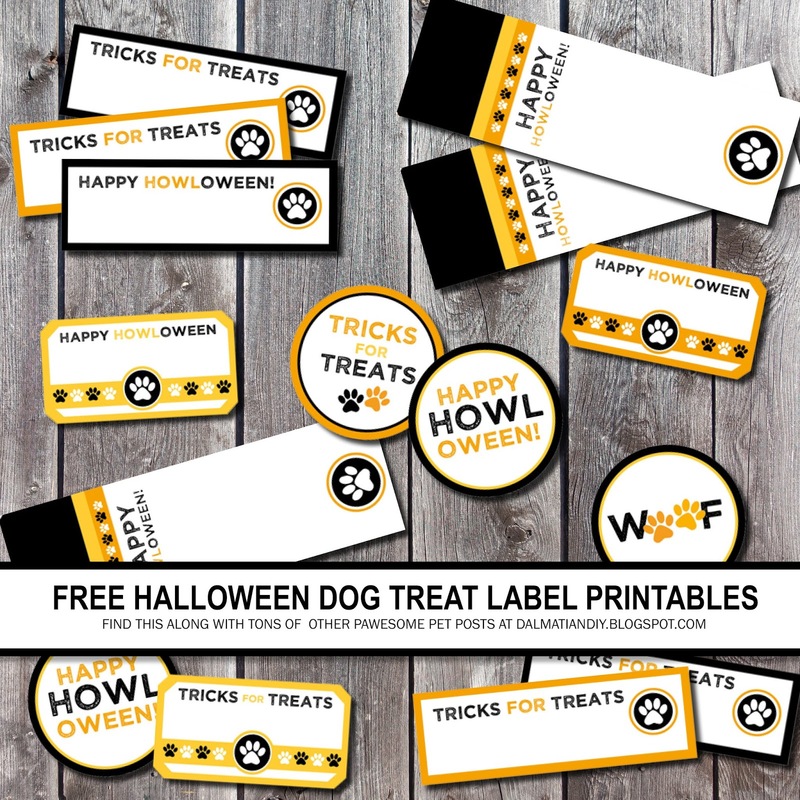 and we have a little treat just for you - free printable doggy treat tags and labels. As with all of our freebies, these are free for your personal / non-commercial use as a little gift from us to you. It's absolutely not required, but it would be awesome and greatly appreciated if you joined us on Bloglovin' and/or social media, if you're not already following the fun. Our links are on the siderbar upper right - please join us! We also welcome social media shares and linking with love, but please link to this post, not the download direct. Thanks! :) Note: These files were revised and updated to our new freebie format in 2018, with a different design than you may see in some old/outdated pins - hope you like them! Halloween can be a stressful and even dangerous time for pets. Toys and treats may be tons of fun, but Halloween also has plenty of potential pet hazards. Like many holidays, Halloween celebrations are filled with interesting decorations that shouldn't be nibbled and human treats that aren't safe for sharing; however, it also comes with the extra scary confusion of crazy costumes, spooky noises, and the doggone distracting stress of doorknocking trick-or-treaters. Eeek! Unfortunately, there may also be an elevated risk from sickos actively looking to harm animals so it's extra important to keep your pets safe and secure. Petco has shared a great post with tips to help keep your pets secure and safe during Halloween. Check it out for handy pet-friendly Halloween tips and cute infographics. I especially like their tips on pet costume safety and stress-reduction and there's even a homemade treat recipe! Yum! Have fun and stay safe this Halloween furfriends! Prepping for Halloween this weekend? You can find all of our archived Halloween posts here, and we'll be back on the 31st with one final spooktacular Halloween post for the year. See you on Monday!